From a tender age, when he would watch auctions at his family’s saleroom in Devon, Tim Wonnacott aspired to follow his father into the antiques trade. His first experience of conducting an auction was at the age of sixteen, when he auctioned the contents of a kitchen to conclude a farm sale! After qualifying as a Chartered Surveyor and a Chartered Auctioneer, he trained in Fine and Decorative Arts at the V &A, before taking a position at Sotheby’s in 1978. By 1985, he had risen to Director, overseeing Sotheby’s operations in the North-West, and in 1998 was appointed Chairman of Sotheby’s South saleroom in Sussex. From 2001 to 2003, he held this position concurrently with the role of Chairman of Sotheby’s new Kensington saleroom in Olympia. Tim’s initial expertise was developed in Sotheby’s furniture department, although a lifetime’s experience in the field has given him a broad-ranging scope of experience across the decorative arts, including in ceramics and silver. 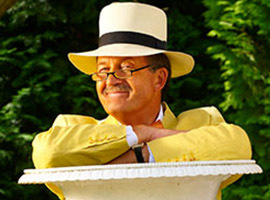 After leaving Sotheby’s in 2003 to focus on developing his media career, Tim launched his fine art and brokerage business Tim Wonnacott and Associates, through which he and his colleagues provide independent advice to buyers and sellers of art and antiques. Tim appears regularly on Antiques Roadshow, and, since 2003, has presented BBC One’s Bargain Hunt. His other television appearances include BBC One’s Restoration; The Great Antiques Hunt, Antiques Roadtrip, and The Divine Michaelanglo, as well as Top Gear! Once described by the Daily Telegraph as ‘Sotheby’s Finest Auctioneer’, Tim puts his saleroom skills to philanthropic use by conducting high-profile charity auctions. The most notable of these was London’s ‘Cow Parade’, raising more than £400,000 for Childline. His most recent ‘Cow Parade’ auction, on the Isle of Man, raised over £100,000 in the presence of Prince Andrew. After a childhood spent in Germany and Italy, Sean Kelly joined the U.S. army, where he specialized in military intelligence and completed a tour of duty in Iraq. 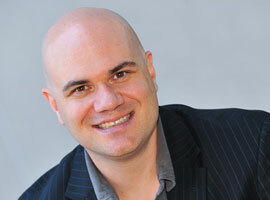 On his return to the U.S. Sean began a career in marketing and sales, and in 2003 founded his own auctioneering business, quickly gaining a reputation for his energetic and engaging speaking style. He has honed his presence and charisma on the rostrum through extensive television work, notably as host and auctioneer of the popular American reality series Storage Hunters, (including its recently launched U.K. version) and as a stand-up comedian. Sean is committed to charitable work, and has used his skills to raise considerable sums for medical and children’s organisations through charity auctions across the U.S.A.
Lindsey Gundersen is an on-location reporter as well as an established broadcaster with many years professional experience. A former Sky studio anchor, she is a wine expert by specialism, and, being a fluent Mandarin speaker, has gained a considerable reputation as an actor and presenter in China. 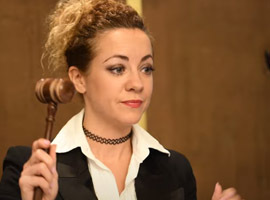 After attending school in Hertfordshire and university in Nottingham, where she read History of Art, she began her career in the auction world in 2006, when she was deemed Auctioneer of the Year at Park West Gallery, Michigan, USA. Lindsey hosts high-profile charity auctions and exclusive wine events in China and has hosted televised auctions in the UK, China and the US. Lindsey currently divides her time between London and Shanghai, where she hosts the ‘China Untapped’ series, investigating Chinese history, art and architecture, and stars in the drama series 'Cafe Zhou'. Edward Rising started with Phillips Auctioneers in Bristol in 1989. He soon worked his way up through the ranks to become a Head of Department in Bayswater, London. Over the past twenty-five years, Edward has worked for most of London’s top auction houses including an eight-year stint as a senior auctioneer for Sotheby’s. During this time, he was entrusted with chairing some of Sotheby’s most high profile auctions, including the collection of the late Gianni Versace, which sold for £7.5m. Edward sold a Mameluk dynasty gilded and enamelled glass finger bowl, known as the 'Rothschild Bucket', for £1.6m in the Sotheby’s London “Arts of the Islamic World” sale and the contents of the Shrublands Park stately home which sold for £4.5 million. Edward has worked extensively in the Fine Art World, conducting decorative art, furniture, fine-art and classic car auctions throughout the globe including sales in Hong Kong, Dubai, Doha and London. He has dedicated much of his time to raising funds for charities. His unique auctioneering style was appreciated by the film director Danny Boyle, who cast him as the 1960s auctioneer in his 2013 film, “Trance”.